Place two ideas here. 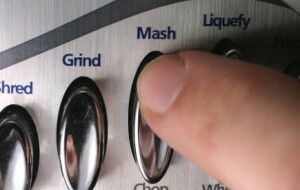 Then press “mash”. Part of the problem is that we think too big. When we want to think outside the box and get creative, we often aim for something truly revolutionary. We’re looking to change the world. We don’t think of mundane things like wheels and luggage. Yet, the people who did put wheels on luggage certainly made my world more convenient. Putting wheels on luggage is generally known as mashup thinking. We mashup two or more things or ideas to get something new. As it happens, a significant portion – perhaps a majority – of our most important innovations result from mashing things up. If you mash up x-rays with computer processing, you get CT scans. Mashing up a mobile phone and a tablet yields a “phablet” like Samsung’s best-selling Galaxy series. Mashing up multiple (government sponsored) technologies yields the iPhone. Mashing up a flywheel and a bicycle yields the Copenhagen wheel. The wheel stores energy as you bike along and releases it when you need some extra power. The problem is that we just don’t think about mashing stuff up. We’re too busy pushing the envelope. We want something shiny, bright, and new. Not something composed of old – perhaps very old – technologies. Rosabeth Moss Kanter tells the story of a mashup that didn’t happen. Gillette owned Oral B, Braun, and Duracell. You might think that they would mash these up and produce a battery-powered toothbrush. But they weren’t the first to market. Other companies won the race while Gillette lagged behind. I’ve been looking for companies that do a good job of mashing things up. Companies that are considered to be very innovative – Apple, Samsung, Google – may fit the bill but I’ve also been looking for “mere mortal” companies. In other words, companies that we might reasonably be able to emulate. Then one of my students alerted me to Mars. Mars Symbioscience has already developed products (and brands) in three different segments: Petcare, Plant Care, and Human Healthcare. I’m not an expert on these categories but I’ve reviewed the products on the Mars website and I’m willing to bet that mashup thinking was part of the process. Mars Symbioscience seems to be a good example of a company that dedicates resources to innovation and mashup thinking. How do they do it? More on that in the near future.